This August my own comic art moved out of the margins to take center stage. It began with what might be the first ever comics show at Phnom Penh’s Chaktomuk Theatre, as a part of the amazing Cambodian Youth Arts Festival. This first showing was in Khmer language, from the 7th to the 11th. The Festival itself was stunning, featuring all kinds of acts from classical drama and theatre to break dancing! It was a great assemblage and this is just the first time it’s been given a go in such a central public forum. 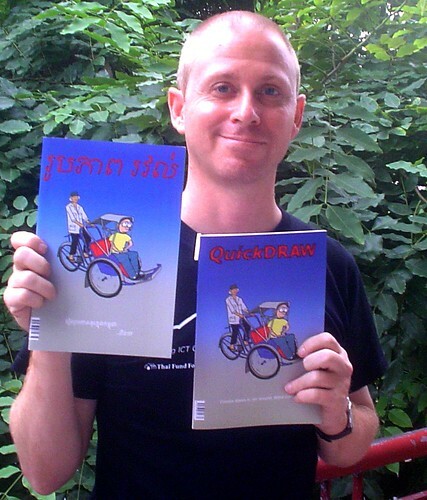 August 18th saw the release of ‘QuickDraw’ #6 in English and Khmer at Java Café, with an accompanying exhibition running through September 26th. We used A2 sized prints and magnets to get a ‘naked page’ sort of feel, and added IPods for supplemental audio and visual info associated with the comics. I was due for an ‘artist talk’ on the 28th, but yapping about my own comics really doesn’t make a lot of sense when there’s so little info available on Khmer comics history. I managed to cover ’50 Years of Cambodian Comics’ in about 60 minutes, that’s a pretty fast pace! It was gratifying to share with the public, and I’m thinking of filming the talk, and maybe doing it again in translation. Between writeups in the Radio Australia, TV5 Cambodia, and public lectures, it’s been a fun and frenetic month. With all the relentless comicking there was not much time to go out, but I did my bit to ‘represent’ for Swing after a lot of hyperbole was slung around. Also this month, Our Books assisted Equal Access in producing two new comics, inked a deal to run a regular cartoon in a local newspaper, helped AsiaLife Guide source references for their upcoming ‘comics issue’, and also ran a table at the Youth Festival! House32 kept busy doing a wodge of web sites, all of which will be duly unveiled in turn. And big congrats to Sang Salapak-er (and newly proud mom) Erin Gleeson! This entry was posted on Sunday, August 29th, 2010 at 7:49 pm and is filed under comics, conference, dance, exposition. You can follow any responses to this entry through the RSS 2.0 feed. You can leave a response, or trackback from your own site.